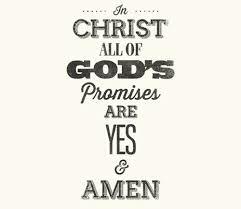 What does it mean all the promises of God are YES in Jesus?!? Jesus in His messianic mission is the personal fulfillment of all the promises in the Old Testament (Luke 24:44). All God’s promises depend upon Jesus alone and only through Jesus is the Father inclined towards the Christian. ← Your wife may be patient BUT you wouldn’t say your wife is patience right?